Berlioz might have denigrated his operatic contemporaries being performed at the Paris Opera, but his operatic works require the same sort of singers. The title role in Berlioz's La Damnation de Faust is a role sometimes sung by lighter tenors. In Nature immense Hymel shows the rewards which the right combination of power and flexibility bring. Verdi's Jerusalem (premiered in 1847) was a Frenchification of his opera I Lombardi and the role of Gaston was first sung by Gilbert Duprez, the tenor who first sang the role of Rossini's Arnold using full chest voice. The roles written for Duprez and his emulators tended to be higher than in Italian opera and Verdi's French operas did not generate much general currency. 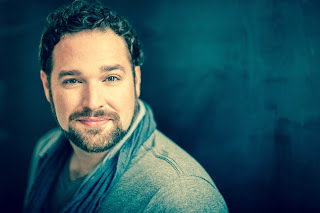 Gaston's Act Three aria is surprisingly lyrical and tender, showing that the heroic tenor role was not just about standing and belting, in fact in his introduction in the CD booklet Bryan Hymel talks about the qualities of eloquence and reflection required in this music. Verdi's Les Vepres siciliennes is another of his French operas which virtually disappeared until the 20th century revival, being known in the Italian version. 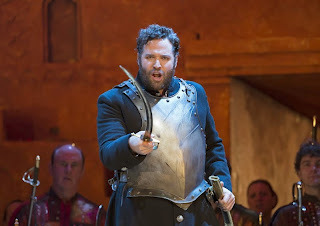 The role of Henri, however, responds to being sung with a narrower, French-style technique and Hymel's singing of O jour de peine links finely into the early French works..
Berlioz's Enee in Les Troyens is a role which has proved a tricky point for many a helden-tenor, I have heard performances in which Enee's first solo comes out more as a yelp than anything else. Berlioz expects a Duprez-like voice with focus and ability to move, not the powerful Wagner-inspired dramatic tenors of the 20th century (in 2003, using a period orchestra at the Chatelet Theatre, John Eliot Gardiner successfully used a far lighter style voice). Hymel, a very fine Enee on stage, shows how it should be done, and that includes folding the top notes into the line rather than putting them in parentheses as many tenors do. But we get much more than the notes, he really makes the role live. An important factor in French opera of this period is the text, the French poetry of the libretto which imbued the music. Berlioz, like Verdi, was capable of responding to nuances in texts and the variety of poetic styles possible. Hymel brings out the words in all his performances, and makes each role live its own individual life. He has sung many of the roles on stage, which of course helps, but his lively intelligence is clear throughout in the way each character is vividly individual and absorbing. Gounod's 1862 grand opera La Reinde de Saba is one of those which get excerpted in recital (again, Regine Crespin has recorded an aria from it) but which we rarely encounter live. I have to confess that it is an opera which intrigues me, and Adoniram's aria Inspirez-moi, race divine with its dramatic recitative is a highly lyrical, rather conventional piece, but one to which Hymel devotes just as much care and attention. With O paradis from Meyerbeer's final opera L'africaine (1865) we are on more familiar ground. The opera was rather old-fashioned for its date (two years before Verdi's Don Carlos premiered in Paris), but the aria is superb example of the old style of using the tenor voice and can be related directly back to Arnold's aria. Like the Guillaume Tell excerpt, Hymel gives us the full scene not just the tenor cavatina so we have the chorus of priests and the whole dramatic scene though the conclusion just lacks the vividness of Rossini's Italian-inspired closing section. Herodiade was an early success for Massenet (it premiered in 1881) and he moved away towards more lyrical, intimate drama. Again there is something of an old-fashioned quality to the work but it makes a strong impression on stage (we saw the Dorset Opera performance with Rosalind Plowright in the title role). Ne pouvant reprimer les elans de la foi is a lovely lyrical number sung by John the Baptist, and here given a long unfolding line by Hymel with a fine response to the words and a really powerful conclusion. The final three items are pieces which you would certainly be lucky to encounter live, having been written in a style which has fallen out of fashion. Ernest Reyer (1823-1909) wrote Sigurd in 1884, supposedly without any Wagnerian influence and it does hark back to Meyerbeer and Gounod with is atmospheric introduction and lyrical aria. L'Attaque du moulin by Alfred Bruneau (1857-1934) dates from 1893, though there is something Korngold-like and filmic about the orchestral writing in the introduction. This might be late, but Bruneau is clearly writing for the same type of voice with the crucial, high-lying vocal line. Henri Rabaud (1873-1949) wrote Rolande e le mauvais garcon as late as 1934. No matter, both arias are enjoyable on their own terms and Rabaud's richly romantic palate in the orchestra is a delight. Throughout Bryan Hymel is well supported by Emmanuel Villaume and the Prague Philharmonic. Emmanuel Villaume brings a stylish confident feel to all the music and gets a nicely lithe sound from the orchestra. The French style heroic tenor voice has seemed somewhat extinct recently, and few tenors have come along to demonstrate the right combination of technique and style. Nicolai Gedda showed how this repertoire might be successfully combined with a modern technique if sung with style. Here Bryan Hymel uses his substantial voice and clear intelligence to give a vividly modern interpretation of this repertoire. 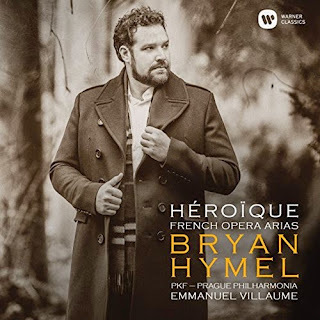 And unlike on tenor Piotr Beczala's recent French aria disc, Bryan Hymel gives each aria a real sense of dramatic context with distinct individuality, you feel you are eaves dropping on a complete performance. There is much fine singing here, but it is the sense of total drama and vivid character which really brings the disc to life.